My husband and I are building an empire with our 8 Rentals & Counting. Since I left my job in April, I have been able to increase our income from $1800 a month to over $5800 a month (check out our October Income Report). While we are fortunate that rents increased at three of our houses, the biggest asset was turning two of our houses into furnished rentals. Thanks to short term rental income, our income has dramatically increase. While furnished rentals are WAY more work AND expense than traditional rentals due to the cleaning, turnover, and maintenance calls… the money and flexible schedule is absolutely amazing. In this business turnover is high, and that means that you always need to have another tenant lined up to go. Unfortunately, since we operate in a small town, that means we need to advertise EVERYWHERE to make sure that we are able to attract the right clientele continuously enough to meet our goals. Well, good news! There are tons of great places to advertise. I personally advertise EVERYWHERE! While there are some places that I have only had ONE inquiry, that inquiry landed me a 25k job over six months and counting. Never discount any place, because you never know if it will be the one gig that ends up earning you the champagne! Airbnb – Airbnb is by far my personal #1 source of traffic. I get everything from amazing one-week full-price offers to one-day large college student parties. Obviously, some are better than others, but overall this is by far my favorite website. Plus it only cost me, the landlord 3% from the booking and the client, 12%. so it is the cheapest around. Home Away/ VRBO – This is the #2 place that I get all of my traffic. While I get much less traffic from here, it is of a much higher price point and length of contract. I have friends that are located in beach towns with very high price points that swear by VRBO. FlipKey – I honestly get very little traffic from Flip Key. Yet, the one traffic I got was a six month insurance gig at a VERY large premium, so it’s worth it for me to list it everywhere. It’s easy to list it and they are free. So it was totally worth my time to get it all lined up. TripAdvisor– I have gotten less than five inquiries from this site. The great thing is those inquiries were also very good. Not tons, but high-cost, professional leads. Corporate Housing By Owner– I am just getting started with this site. I had the opportunity to hear the CEO talk at a couple of conferences. I figured it wouldn’t hurt, since the business clientele that they attract pay some of the highest figures. The great thing is, there is no fee off any bookings just to sign up. HomeSuite – I have not tried them yet but I am getting my ad up this month. They are the newest company in my area that I have heard of. My buddy who has a TON of places in San Francisco LOVES Home Suites. He told me he makes more money with them than with any other company and they are easy because he is dealing with a corporation not a client. People Shop Around– It has not been unusual for me to get people that mention they have seen the house in different places or question the prices. Therefore, I have made sure to strive to price them the same on every site. I do price those who have more expensive fees higher than those who have lower fees. This way I always make the same amount no matter the platform. Customer Service: Who Will Write Your Add- Corporate By Owner, Trip Advisor, Flip Key and Home Suite all having amazing customer service to the point that they will set up the ad for you. I actually found Flip Key because they contacted me offering to set everything up for me. Different Areas Work Differently- The thing I have learned from talking to others in this business is that every area is a little different. Some areas, one company works amazing… other areas another one works better. All of this is based on area and clientele, demand and tons of other factors. So try everything, because remember you need all the help you can get since this market is so transient. Try everything and see what works. Once you know the area and your markets, you can become selective… but there is no way as a newbie I would be picky about what company the leads are coming from. 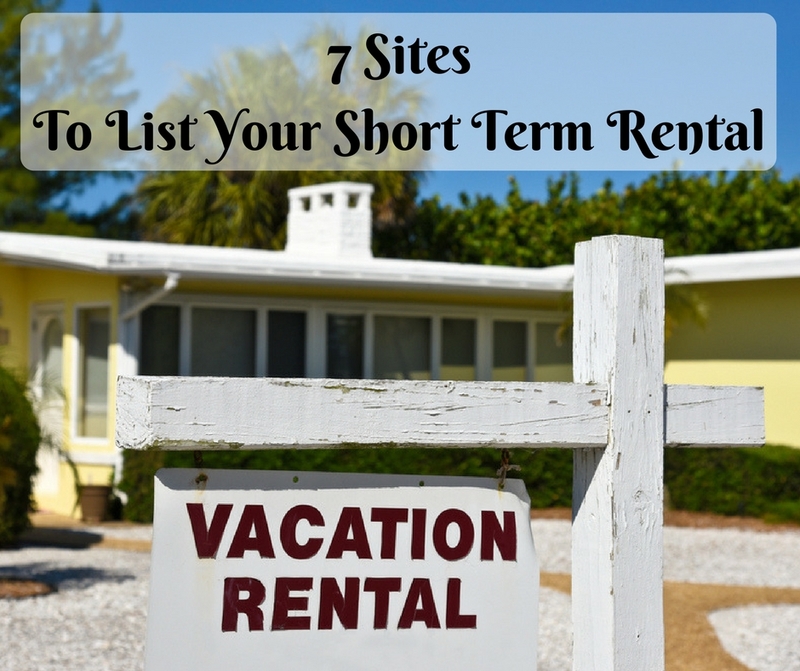 Did I miss any places that you list your rental? Which one is your favorite and what has been your experience? PS- Thanks for using the links and supporting Reluctant Landlord. While it doesn’t cost you anything, it really helps me be able to continue to bring new ideas and great content. Thank you for the support!